Hormones are natural chemicals that are produced in the body. The job of hormones is to control how the body functions. The main female hormones are estrogen and progesterone, which are produced in the ovaries. These hormones play an important role during reproduction. 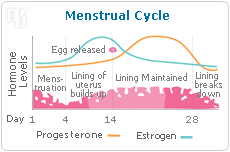 Estrogen is made during the menstrual cycle. Its job is to grow a thick layer of tissue inside the uterus each month. Estrogen also affects the bones and the health of the heart and blood vessels. Progesterone is made by the ovaries during the second half of the menstrual cycle. It helps to further thicken the lining of the uterus. During menopause the ovaries slowly stop making these hormones. Just as there are many reasons for high levels of hormones, including insulin resistance, stress, malnutrition, or certain medications, there are similarly many explanations for the cause of low hormone levels. Even so sometimes the cause of low hormone levels cannot be ascertained. Menopause. The most common reason for having low hormones levels is menopause. This is a time in a woman's life when menstrual periods slow down before eventually completely stopping. Menopause usually begins between the ages of 40-50 years. Removal of ovaries. Hormone levels will drop if a woman has both of her ovaries removed. Menopause symptoms start abruptly when the ovaries are removed because there is no more estrogen produced during menstruation. Other reasons. 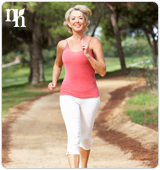 Too much exercise may cause estrogen levels to drop, which can stop women's monthly periods. Estrogen level may also drop if a large amount of weight is lost. There are a range of causes, some preventable and some not, that account for low hormone levels in a woman's body. Therefore discovering the source of these causes is obviously important for reducing their symptoms. Having outlined the causes of low hormones, continue reading to learn about the symptoms of low hormone levels.